Need help engaging an infant, toddler or preschool-aged child? 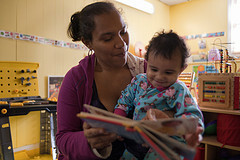 Check out “Resources for Early Learning,” a website produced by the Massachusetts Department of Early Education and Care and the WGBH Educational Foundation, with support from federal Race to the Top-Early Learning Challenge funds. “This site provides exciting, engaging media-rich learning opportunities for educators, parents, and caregivers of children. From detailed lesson plans to simple, everyday activities, you will find everything you need to help your children succeed,” the website explains. The goal is to empower adults — parents and early education and care providers — by giving them the “skills, training, knowledge, and understanding needed to help young children grow and learn.” The website was developed by a team of experts, educators, and parents. In the section for educators, there is a nine-unit curriculum for children ages 3 to 5 that uses a media-based approach to cover STEM (science, technology, engineering, and math) as well as English Language Arts. The curriculum includes activities and recommended books to read out loud. This approach is designed to help children develop academic and social and emotional skills. Educators will also find a search feature that finds activities. And there’s a link to a range of best practices in professional development. The section for parents features 16 topics and related activities that can be done with babies age 0-15 months and toddlers age 12-33 months. The topics include math, writing, reading, building houses and homes, plants, water, and science. “Whether you are a new or experienced parent, you’ll find just what you need!” the website promises. Parents will also find an activities search feature as well as videos on parenting. Have questions or comments on the website? Submit them here. As the website says, well-prepared adults can make every day “a learning adventure” for infants, toddlers and young children who are naturally bursting with curiosity and an eagerness to learn. This is so WRONG! Screen time should be REDUCED, not encouraged by the Department of Early Education and Care. I am DISGUSTED!